The Wisconsin Tennis Association proudly recognizes Suellyn Schellpeper-Rohrer, Oconomowoc, as the Volunteer of the month. Her dedication and commitment to tennis in Oconomowoc and advocacy for the City of Oconomowoc Parks, Recreation and Forestry Department, the Oconomowoc Area School District and the Oconomowoc Community Tennis Association has been exemplary. It is because of her ambition that this community has seen growth in the sport of tennis and is able to enjoy the collaborative tennis complex at the High School. Suellyn has also volunteered in many ways for the Recreation Department. She served on the Park and Recreation Board from 2002 to 2005. Suellyn often volunteered for teen nights at the community center assisting in the organizing and coordinating of those events as well as supervising the events. She has also spearheaded the community Tennis Block Party since its existence in 2005 and the fall community tennis event at the High School. She has helped to develop a community tennis program as well as build the program at the school district. She initiated the formation of the Oconomowoc Community Tennis Association of which she has served as President since its existence in 2005 among several other volunteer efforts that she has been involved with. 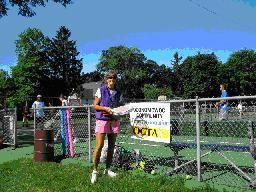 Due to her hard work and dedication, Oconomowoc has hosted USTA Block Parties, received the 2007 USTA Midwest Section Community Tennis Association of the Year Award and USTA Facility Award and has been named as a 2009 USTA Top 50 Tennis Welcome Center. Suellyn serves as the head tennis coach for the Oconomowoc High School boys and girls tennis teams. In addition she volunteers for the Oconomowoc Recreation Department hosting the “free” drill of the week and Adult doubles league. She also works at promoting tennis in general throughout our community and you can find her cheering on most tennis events in Oconomowoc. The WTA congratulates and thanks Suellyn for all her hard work and tireless effort on behalf of tennis, junior players, adult players and the City of Oconomowoc. I started playing tennis age 8 played in first tournaments at age 10. Roland Mueller, one of the first USTA Professionals in the state of Wisconsin, was my uncle and as little children we would take a city bus down to his small two clay court facility in Milwaukee and play tennis and drink orange sodas all day. As a retired high school educator working with adolescents and their families has always been important to me. Becoming involved with the local girls and boys high school tennis teams was a natural. As a community volunteer working on the Oconomowoc Parks, Recreation and Forestry Board, seeing the need for a tennis facility was apparent. Resigning from the board and making it a personal commitment to talk and talk and talk until interested parties began to listen and respond to building a community tennis center evolved. Bringing life into our community tennis program from all angles; schools, private clubs, and public recreation continues to be an ongoing personal goal. Creating free public events for individuals, families, and children to experience the “love of the game” brings energy and renewal to my heart each and every time. Giving back to the community you live in is so important. For me tennis is a game that combines physical fitness, personal enjoyment, socialization, and friendly or fierce competition! Who could ask for more?